The story of bravery and incredible fighting strength of rhino Thandi has inspired so many to get involved in the fight against rhino poaching. This video shows Thandi enjoying some relaxed family time with her sprightly calf Thembi (Hope). 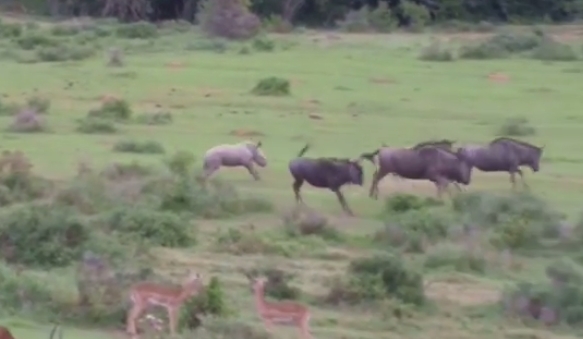 She is clearly enjoying a game of tag with the wildebeest. Thandi and two other rhino were attacked by poachers in March 2012. Thandi was the only one to survive. She became the first rhino to ever survive a poaching attack where thousands of others have died over the past three years. Thandi has endured numerous operations since her attack, including pioneering skin graft surgery under the care of Dr William Fowlds. In December 2013 blood tests after her last facial procedure revealed that she was pregnant. After waiting for many months, we were overjoyed that she gave birth to a female calf, Thembi, on 13 January 2015. Responses to "Baby Rhino Chases Down Full Grown Wildebeests"
After that, he will lay down and sleep for hours. How cute ! !